The year is 2008. Facebook is slowly starting to overtake Myspace, Obama and McCain are contesting for president, and the nation’s housing market has flipped upside down. Dennis Nash (Andrew Garfield) is a loving single father trying to make ends meet as a construction worker. He has been served an eviction notice for an overdue mortgage and will soon be evicted by the infamous real estate agent Rick Carver (Michael Shannon) if he can’t front enough cash to retain the property’s title. Desperate to keep his family home, Dennis and Rick begin to forge an atypical work relationship, although Dennis has so clue just how far he will have to go in order to keep his dream of being a property owner. 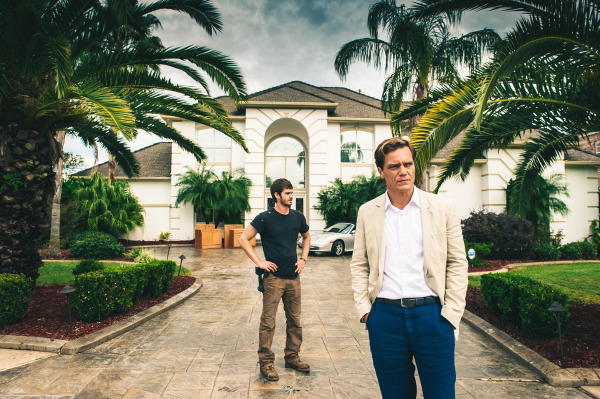 99 Homes, directed by Ramin Bahrani, takes the American Dream and presents it to us in such a rich and complex way. An interesting spin on the rags-to-riches cinderella story, the film focuses more on the moral dilemmas that arise when people are confronted with compromising their values for a few extra bucks. It’s an intimate and personal story, one the follows Dennis and Nash’s relationship wax and wane with each new scene. Andrew Garfield is great as the leading man, and he brings much authenticity to his role, but the real scene stealer is the fierce and questionable Michael Shannon as the ruthless and captivating Rick Carver. Always a great performance actor, Shannon is mesmerizing in 99 Homes; it’s hard to imagine the role being played by anyone else. Supporting work by Laura Dern is also very good, adding a welcome emotional layer to the film. Bahrani shows off plenty of directorial skill and creates a space for the real tension of the on screen situations to shine though. Weather we are watching a family get evicted, or a police standoff, the film is powerful and gripping, but still loaded with warmth and humanity. Bottom Line: 99 Homes is an excellent, tightly crafted drama that is fuelled by outstanding performances and richly complex, pertinent subject matter.